Wall Street opened little changed on Wednesday as investors waited for the conclusion of the two-day Federal Reserve meeting for indications of a third interest rate hike this year. The policy statement and projections are due to be released at 2 p.m. ET (1800 GMT). Fed Chair Janet Yellen will hold a press conference half an hour later, which will be closely watched for views on inflation. The central bank is likely to keep interest rate unchanged and say that it will start unwinding its holdings of about $4.2 trillion in bonds and mortgage-backed securities. “Fed will likely be a non-event, but if they are slightly more dovish in their language, I think you could see a reversal in the banks, but I don’t see a lot of activity,” said Aaron Clark, portfolio manager at GW&K Investment Management. The plan will limit the amount of maturing bonds used each month to purchase new ones. The initial cut will be $10 billion per month, probably beginning in October. Inflation has remained stubbornly below the Fed’s 2-percent target rate, but a recent data showed uptick in domestic consumer prices, which raised the chances of a December rate hike by more than 50 percent. Traders were betting on a 56.4 percent chance of a December hike, compared with 46.8 percent a week ago, according to the CME Group’s FedWatch tool. At 9:39 a.m. ET, the Dow Jones Industrial Average was up 0.57 points, or 0 percent, at 22,371.37, the S&P was up 1 points, or 0.04 percent, at 2,507.65 and the Nasdaq Composite was down 2.18 points, or 0.03 percent, at 6,459.14. Though all the three indexes moved in narrow ranges, the S&P edged up to another record level. Eight of the 11 major S&P sectors were higher, led by 0.50 percent gain in the energy index .SPNY. Oil prices were set for their largest third-quarter gain in 13 years after the Iraqi oil minister said OPEC and its partners were considering extending or deepening output cuts. Pfizer rose more than 2 percent, lifting the S&P and the Dow higher, after Morgan Stanley upgraded stock to “overweight” from “equal weight”. Adobe fell 4.5 percent after the Photoshop maker’s revenue forecast came in-line with estimates. General Mills was down more than 8 percent after its quarterly profit missed estimates, hurt by lower sales of its yogurts and cereals in North America. Western Digital slipped about 6 percent after Japan’s embattled Toshiba said it agreed to sell its semiconductor business to a group led by U.S. private equity firm Bain Capital. Bed Bath & Beyond sank more than 16 percent after the home furnishing retailer reported earnings and sales below estimates, prompting a slew of price target cuts. Advancing issues outnumbered decliners on the NYSE by 1,539 to 907. On the Nasdaq, 1,137 issues fell and 1,089 advanced. 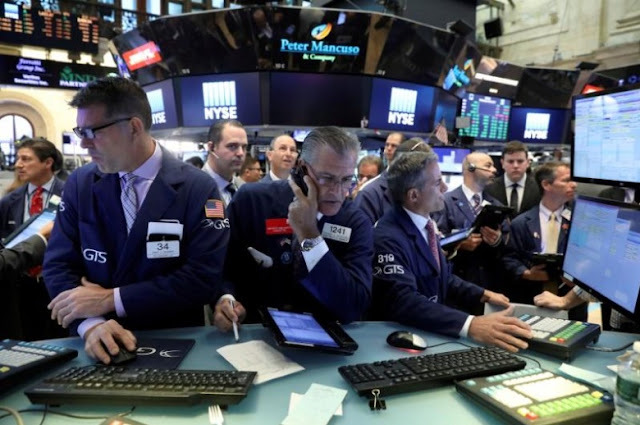 Wall Street opened little changed on Wednesday as investors waited for the conclusion of the two-day Federal Reserve meeting for indications of a third interest rate hike this year. The policy statement and projections are due to be released at 2 p.m. ET (1800 GMT). Fed Chair Janet Yellen will hold a press conference half an hour later, which will be closely watched for views on inflation.